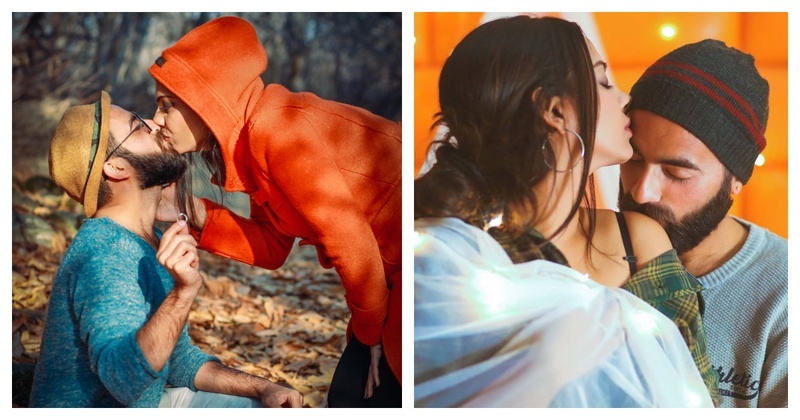 This couple brought back our faith in love with their Post Wedding Shoot! Nitin, is a wedding photographer and Shanaya - an ex-crew member of a premium airline, is his work and real life partner. Living life on the edge and chasing high speed dreams, these two crazies found an anchor in each other and have been inseparable ever since. Nitin is a wedding photographer and Shanaya has been helping him as a photo stylist. She’s been truly instrumental in bringing out other people's life in front of the camera to make sure he captures the true essence of a person. While Nitin’s work has been always kept him on the roads, in different cities, surrounded by glitz and glamour and blinded by the lights, Shanaya had of-lately been dreaming of being in front of the camera, for a change! So, Nitin, like a dotting bae, decided to surprise Shanaya with a trip to Gulmarg in the month of January and made her dream come true. *literally*! The trip was welcome, despite the sub-zero temperatures and being surrounded by snow laden mountains. Oh and Shanaya also managed to get her dream proposal out of Nitin! These adventure junkies, high on love were not deterred by the sub zero temperatures which at times even went down to as low as -15 degrees during the shoot. With the pictures coming to an end, what do you think about having a post-wedding shoot with your other half!